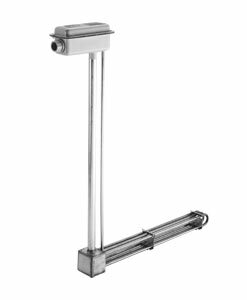 These over-the-side immersion heaters are designed for vessels where through the side immersion heaters cannot be conveniently installed. These heaters are installed through the top of the vessel with the heated portion of the unit along the side or at the bottom of the tank. Natural circulation of the fluid inside vessel allows for even heat distribution. Terminal houses or lead wires are provided for power connections. Alkaline soaking and cleaning copper sulfate, electro cleaners, mild acid baths, wash and dip tanks containing alkali, oakite, caustic soda, detergent and other aqueous solutions.